Flat champagne is a tragedy. These bottle stoppers are the perfect cork or even screw cap replacement. They'll slip smoothly into the neck and create an airtight seal, keeping air out and preventing loss of that deliciously tickly fizz that make champagne, sodas, sparkling waters and ciders, as delectable as they are. Pop, pop, fizz fizz, oh my, how easy it is! Replace boring and unweildy corks! Every try to get a cork back into the bottle once it's out? Keep your bottles cool and fresh while topped with warm style. 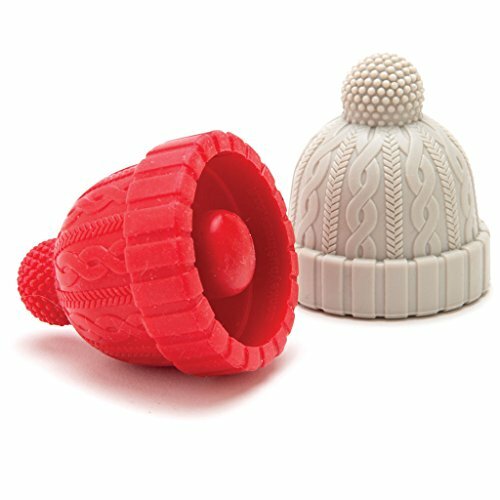 A tip of the cap to these giggle-inducing, charming knit caps, complete with a jaunty pom pom, all in durable, washable and endlessly re-usable silicone. Keep oxidation at bay and freshness stable. With this set of bottle toppers, you'll be able to enjoy that special bottle bit by bit, without fear of losing taste or quality. Enjoy your beverage at your leisure when you've got Monkey Business stoppers to preserve your pleasure. Sealed with a smile: Get a giggle out of topping off wine bottles with a beanie complete with jaunty pom pom. If you have any questions about this product by Monkey Business, contact us by completing and submitting the form below. If you are looking for a specif part number, please include it with your message.